The Vital Organization offers just enough background followed by a specific, real-world examples of putting these principles into action. 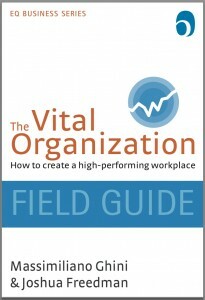 Drawing on the authors’ work with organizations such as FedEx, Microsoft, Komatsu, HSBC, the US Navy, and the UN, this Field Guide is an operative manual for managing to create a great organization despite the chaos around us. In volatile markets and rapid change, what really creates organizational value? New insights from neuroscience and organizational research reveal key drivers that make the difference. These drivers define the Vital Signs model for performance. How can leaders use the new research insights to actually create organizational vitality? What are the key principles and the specific tactics that make the difference? What does it look like to put these principles into action? The Komatsu case provides a real-world example of these concepts and solutions. What are the vital lessons every leader can apply to their organization? The studies that led to the Nobel, Kahneman explored decisions to buy and sell on the equity markets. He found that when stock prices are rising, people are less inclined to assess the risk and focus on performance. When the stock prices fall, however, people are far more likely to give priority to the safety of their investments. The result is not rational: People buy when stock prices are high, run away when stock prices fall (losing money) and then take refuge in bonds (perceived to be safe but with very low interest rates). So even in a “hyper rational” situation with extensive data for decision making, the result is… Not optimal… and clearly not entirely rational. Another example happens around us every day at the office. In all the manuals of management you find rational organization of activities; managers are supposed to plan, define goals, control: all activities based on intensive analytics. Think instead of what happens in reality: how much time is really devoted to this type rational process, and how much is used managing misunderstandings, trying to calm people, covering risk, or struggling to maintain power within the company? All this is to say, for years we’ve described “the world as we would have liked,” while ignoring reality. It might be easier if people were purely rational at work, but it’s totally irrational to pretend that’s the case. Confront reality: People have a rational side and an emotional side. If we do not put these two sides together, we will not be able to understand the actions and reactions of people. If we try to understand people by analyzing their behavior only using rational intelligence, in many cases we are forced to say, “some people are just weird.” We become convinced that it is really difficult to understand and grasp the meaning of certain behaviors. In reality, to understand people we have to add also the emotional to the rational analysis. In fact, our behaviors are influenced by what we think, but also by what we feel on an emotional level. Seeing how our brain actually works will allow us to better understand people and how to best use the potential of each.